I just came across a great photo blog of one woman's trip to work, I really recommend you take a look, as someone comments, "a picture paints a thousand words". It made me rethink my day, was there some way I could explain to everyone out there why I only managed two hours at my beloved OH's Beer Festival on our wedding anniversary? Well I can't do a similar photo blog, I missed that opportunity, and my disabilities are kind of subtle. I get tired very easily, and things ache and twinge as a warning before they hurt, and I have a tendency to brain fog when I've been overdoing it. So forgive me, but my post will not be as fantastic as the lady's mentioned above as I can't really give you visual clues as to why my day was so challenging. He had to set off to the Festival at 9am as he had the keys open up the Hall for everyone else. I was up, but not quite dressed and certainly not ready to go out. I asked when my assistance would be useful and was told, "Opening time", which was 12 noon as they would probably be short staffed to start with. I waved him goodbye and said see him later ... with my heart sinking. I'd hoped he'd say 4pm or something like that when I'd been up long enough to eat, go to the toilet, have another rest and pull myself together ... it had been a bad night after a string of bad nights. I'd had about three hours sleep. Before anything else I went up to the chemist on our little row of shops to collect my prescription - I'd noticed the day before that I was down to just one strip of one kind of tablets and the prescription had been ready to collect for a week - I just hadn't got around to it. I did a side trip to photograph the plaque on the wall of a row of nearby terraced houses for a blog post I'd done while I couldn't sleep. I've just added an afterword to my blog with the photo, it was satisfying to prove my deductions about the location of the house had been correct. This wasn't a long walk, and I took it slowly (I only have two speeds, slow and very slow) maybe twenty minutes out of the house all told including the wait in the chemist for my turn at the counter, but I could feel my feet dragging when I got back to the house. And my knees had been playing up all week, I can only do stairs one at a time at the moment as my left knee doesn't currently have sufficient umpf to push my weight up the step. And then it was out just before 11am for the bus, the first of several. The bus into town isn't bad, even though despite what the OH says they don't run every ten minutes, what actually happens is there are two every twenty minutes - but that's life. 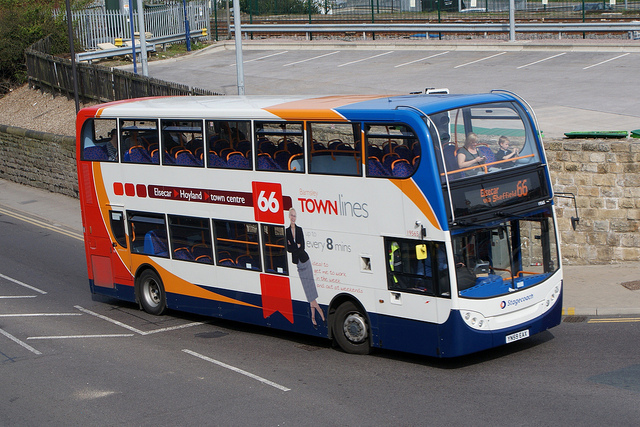 I was lucky that once in the bus station I didn't have to wait long for a number 66 to Elsecar. It's about seven and a half miles and nineteen minutes from Cudworth to Elsecar on the most direct route by car according to Google Maps but on a bus from Barnsley, that takes the most circuitous route possible, stopping at every stop (well it was Saturday lunchtime) it's over eight and a half miles and takes forty minutes. I was falling asleep before we reached Hoyland Common, and only trying to work out where on earth we were kept me awake through Jump and the bottom end of Elsecar. I was doing that thing where you drop off to sleep, your head nods and the bob of your chin on your chest or the stretch of the back of your neck is enough to wake you up again. I staggered off the bus across the road from the Milton Hall at 12.05pm really, really needing to sleep. This is why commuting to Sheffield from Barnsley for work ... didn't work! I don't know what it is about travel but it really tires me out. I'd tried to find a link to the Beer Festival earlier and in Googling it had landed on the pages for the previous two Barnsley Festivals held earlier this year instead. When I told the OH this he opened Dreamweaver with the intention of updating the pages so they forwarded to the current Festival's info instead. Did I say his web-book was struggling with an Excel spread sheet? well you can imagine what it thought of Dreamweaver! On top of this he, being NOT the organiser of the festival, but still the person most in charge, was needed to sell t-shirts, answer questions about books, lock up customers bicycles and a multitude of other things so I said I'd do the web pages too. Time passed, I stared at the progress bar in Dreamweaver in a dreamy state myself ... I had to update three pages, archive the old versions and test the forwarding just to make sure - all on a old web-book now tethered to the OH's phone as our 'dongle' hadn't been able to get a good enough signal to upload one page let alone download three and upload six. By the time I looked at my watch again (it's still in my pocket, the strap is broken and I've been spending my money on important things like books rather than buy a new one) it was after 2pm, I'd been there two hours, had one half pint of beer, the Great Orme Welsh Black pictured above (Ha, you thought that pump clip image was just for pretty! Hover over it for a description of the beer!) eventually fetched from the bar for me by the OH in between other errands and a bag of crisps to keep me going. I told the OH I really had to go if I was going to make it home without seriously falling asleep again. I hadn't pulled a pint this time, at least in May I was propped up at the end of the bar on a stool and managed to talk to a few people and try four or five different beers. At least on the way back if I did fall asleep the bus driver would throw me out at Barnsley bus station. I left the building at 2:15pm and was walking in our door by 3pm. The difference - the blessed 66 goes in a straighter line on the way back and as it was leap frogging with another bus this meant it only picked up passengers at every other stop. Plus there was a late running Cudworth bus in the stand at the bus station and the driver was in a hurry to make his time up so we fairly zoomed home. I went straight to bed ... where I slept for ONE hour! Damn! Blast! Cat! She wanted to go out of the front, she wanted to come in the back, she wanted her tea, she wanted to go out again, eventually I gave up trying to get back to sleep. Plus my eyes really hurt, I am trying not to rub them but I kept catching myself doing it ... more eye drops only seemed to solve the problem for an hour or so. I'm a mature perpetual student. I studied with the Open University from 1998 to 2014, history mostly. I used to enjoy volunteering at the local Archives transcribing old documents and helping other people with their Family History queries. I like to think I'm pretty good at IT for someone of my age group, so I can often assist there as well. I've been researching Family History for over twenty-five years, and I've been a Campaign for Real Ale member longer than that. I was diagnosed with Crohn's Disease just over eleven years ago and had to finish work nine years ago. I reinvented myself as a Local History speaker, specialising in WW1 Soldiers and War Memorials, but had to give that up due to ill health two years ago. I am an Official Remote Volunteer for the IWM's War Memorials Register and was an Official Remote Volunteer for the IWM's Lives of the First World War (2013-2019). In October 2017 I began an MA in the History of Britain and the First World War at Wolverhampton University. New month, new season, new start? Sayles Family Postcards – who are they? The Making of OUTLANDER (Seasons 3 and 4) coming Oct. 15! Sweet second great grandmother, Matilda, was a bigamist.